The Board of Assessors Monday set a tax rate less than half of what was expected after the Madison Paper Industries mill revaluation cut $150 million from the tax rolls. MADISON — The Board of Assessors approved a tax rate of $19.50 per $1,000 of assessed value on Monday, an increase that is less than half the tax hike initially projected after a revaluation lopped nearly $150 million from the tax assessment for the paper mill operated by Madison Paper Industries. “We’ve tried to strike a balance between what we can take out with a loan and what voters approved at the special town meeting in regard to the tax rate,” said Bill Van Tuinen, assistant to the board of assessors. The rate, which represents an increase of about 11 percent from the 2013-2014 tax rate of $17.53 per $1,000 of assessed value, was approved unanimously by the board. Tax bills are scheduled to be mailed on Tuesday and taxes are due Oct.22. “It’s the best thing that could be done given the situation,” said Al Veneziano, chairman of the Board of Selectmen. Homeowners and local businesses had been bracing for a 30 percent increase in their property tax payments. But residents approved a series of measures at a special town meeting last week. Officials are working to establish a line of credit worth $2.5 million approved by residents at the special town meeting. Voters at the town meeting approved both the line of credit and the use of $800,000 in surplus money to help fund the town budget. Residents rejected spending $500,000 in economic development money, which would have incurred a minimum penalty of at least $100,000 on the town from the state. Officials are continuing to explore the possibility of using the economic development, or TIF, money to make up for some of the tax revenue lost in the mill revaluation and met with state lawmakers last week to discuss whether TIF money may be used for tax relief. Town leaders are also continuing to look at ways in which the state can help mitigate school and county taxes in Madison. The drop in the value of real estate in Madison, caused by the revaluation of the paper mill, would not be reflected in the school and county taxes this year. Madison homeowners and businesses would have to pick up the taxes to make up for the cut in the mill’s value. 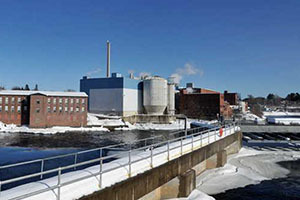 During last week’s meeting, which lasted around three hours and drew several hundred people to the auditorium at Madison Junior High School, Van Tuinen said that decline in demand and increasing competition in the manufacture of super-calendered paper, the particular type of paper that the Madison mill produces, have contributed to the drop in the mill’s value from $229.7 million in 2013 to $80 million. In 2013, Madison Paper Industries paid more than $3 million in taxes, making up about 40 percent of the town’s property tax base. Madison is facing increased competition from Nova Scotia, where the recent reopening of the Port Hawkesbury Paper mill, aided by government subsidies, has created a tough competitor in the super-calendered industry, said Van Tuinen.